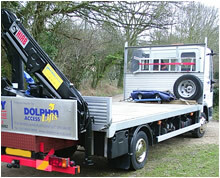 Do you have a need to provide a temporary lifting solution for the less able? 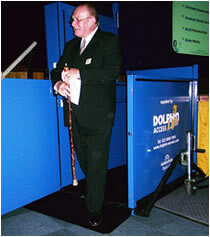 Perhaps you are holding a conference or performance on a raised stage or have a need to provide access to an exhibition stand or split level? If the answer to the above is YES then we might well have the solution. Due to popular demand we have (through our partners Garaventa Accessibility) manufactured a portable lift which is capable of travelling up to 1500mm (floor to floor). The lift has an interlocked gate at each end of the platform for safety as well as all of the normal safety devices found on permanently installed lifts. The platform is of a through access configuration, meaning that you enter the lift at the front and exit off of the rear. The lift is delivered by lorry and lowered to the ground using the lorry’s own crane. The lift is then wheeled into position and set up to suit the distance between floor levels. It’s as simple as that! Please feel free to download our PDF drawing which shows all of the relevant dimensions. By doing so, you will have piece of mind, knowing that the lift will suit your requirements as well as fitting through doorways etc (when wheeling the lift into position). For further information, prices and availability please contact us.